A review of the “Urban Blue,” the Blue Mind Five Summit, which took place on May 11, 2015 in Washington, D.C.
“Get your blue mind on!” is a frequent expression and admonition of Wallace J. Nichols, known simply as “J” to most of us. J has been a leading thinker, researcher, and activist extraordinaire when it comes to all things related to water. The author of the recent bestselling book Blue Mind (July 2015), he is a passionate advocate for ocean and water environments and for the healing and recuperative powers of water in all its forms. 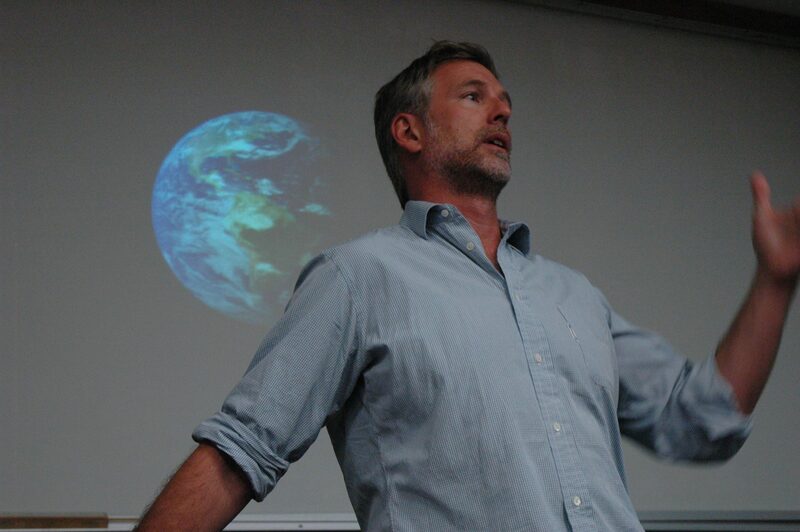 A half decade ago, he began convening an eclectic group of like-minded academicians and others in an intensive one-day conference called “Blue Mind,” a collective exploration of the many different ways that the power of water might be studied and applied. In late May of this year, J helped convene the fifth of these unusual meetings, Blue Mind 5. For this year’s event, the emphasis was to be on urban blue, and I was honored to have been asked to give the closing keynote for the meeting. In addition to discussing a bit of my own research and writing, a key charge given me was to listen throughout the day and to summarize and synthesize the main themes and overarching conclusions. This was a tough job, to be sure, but a fun one, and what follows here is a modest attempt to put down on paper some of what I learned that day. The meeting took place in the elegant digs of the Carnegie Institution of Science, in Washington, DC. It was (and is) a huge agenda, an agenda for a lifetime. 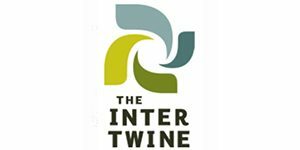 How can we be healthier, saner, better human beings through connections with water, and how can we be better stewards of our ocean and water environments? While for many of the participants, the setting for their own research, practice, and activism, was oceans, this was not always the case, and sometimes it was the municipal pool, or the float tank, or the lake, or river. So from the beginning, there were some interesting and stimulating ambiguities, but water in every form imaginable became the subject of our appreciation and celebration that day. Part of my task was to look for the urban manifestations and implications of the topics being covered so eloquently and insightfully. It was not a hard thing to do. We are an increasingly urban world, and increasingly call cities home; every topic discussed held special meaning and importance in understanding, and perhaps shifting, modern urban life. And many or even most cities are located near water. J Nichols has an uncanny knack for joining together sometimes disparate speakers, while always extracting synergy and logic emerging from the interactions. The day was largely structured around four main panels: The New Story of Water; Science of Solitude; Sleeping Deeper; and Submergence. I liked the look of the day— topics rarely thought about or considered much by urban planners, but clearly critical issues for us to think about in relation to cities. The first panel of presentations wondered out loud about the importance and power of storytelling, and ways we frame the stories we create and tell. There was a strong sense that a new story about water was needed, and a helpful shift away from the tired, older story (or stories) we have been telling. The old story of water was a negative one, a pessimistic one. Addressing the immense water and ocean agenda we are collectively facing requires a new kind of story about effective change and a new sense of the appropriate messenger. Ocean advocate Danni Washington spoke eloquently about the need to “change our conversation, to flip the switch, because we’re not going to inspire anyone by telling them that they’re doing horrible things.” The story must increasingly be about the positive benefits and qualities of water, what we love about oceans and water. M. Layne Kalbfleisch, a cognitive neuroscientist, studies talent and inspiration, and offered insights from her research about how color (blue specifically) enhances mental performance, and the need to better appreciate the ways in which the body’s resting state (its autonomic systems) creates the conditions for daydreaming and imagination. Becoming more in touch with our “endogenous heuristic” (our internal playbook), must be part of the new sensibility. The new story must include, she told us, a new understanding of “water as medicine” (more on this below) and that “water flows in one direction.” Flow in cities is a defining force and a way of fixing relationship and position: some are upstream, others down. Kalbfleisch played some music for the audience from the group The Stray Birds, specifically a song called “I Dream in Blue,” and then asked us to identify the many references to water (Listen to the song here). It was a convincing point that music frequently contains deep connections and references to water, and also perhaps that we can and must tell these new stories of water in many different ways, including through music, drama, and poetry. Later in the day we heard the moving poetry of Jamie Reaser and saw the beautiful photographs of National Geographic Photographer, Anne Doubilet. Just and equitable access to water, and its benefits, was yet another theme and another necessary element of the new story. Harvey Welch, of Carbondale, Illinois, described what it was like to be African American, growing up excluded from enjoying public pools. Later in life, he has lead the charge to build a new outdoor public pool, something that has proven harder than expected (and still is not accomplished). It was a reminder of the entrenched inequalities, but also the promise of water as a bridge, as an opportunity to heal past injustices and to create spaces and places for coming together. Part of the charge in crafting a new story is to think more carefully about who we hold up as purveyors of change. We have relied heavily on a “hero model” of ocean conservation and protection, which was noted by several speakers. Stiv Wilson, with the Story of Stuff, made this point through a provocative self-assessment, pondering the imagery he has commonly used to present himself to the world (and to audiences like ours)—the image is of singular hero, saving the day (an image of him steering a ship during a storm, strong and in charge). The reality is that addressing ocean conservation problems today will require changes in how we buy and consume, as well as through legislation. But it is not to be found in singular herculean acts of saving the day, so much as in more pervasive, collective shifts in our behaviors and buying patterns, and in our political action. Wilson showed a new film about micro-beads and suggested that it might indeed represent, he feels, a more effective way of reaching average people and effecting deep change. Wilson was recently profiled in the New York Times (looking a lot like the hero, ironically), with good news that states continue to enact restrictions on micro-beads in response to consumer concerns (California appears headed for a ban on both synthetic and organic micro-beads). The prospect of state-level restrictions and bans seems enough to shift companies like Proctor and Gamble away from micro-beads in their body and facial scrubs. I frankly did not know much about micro-beads before Wilson’s presentation, but the inability of conventional water treatment plants to filter them and the possibilities of working their way through and up the aquatic food chain is a scary prospect indeed. It was the first of a number of references that day to the ways in which humans consumption and lifestyle choices negatively impact the blue realm, and in turn our own human health. As is so often the case with water, optimism and pessimism blend together, though the former, thankfully, may be carrying the day. And the issue raises once again the many ways in which the transition to urban lives may induce a mental distance between action and impact (where do those micro-beads go when they slither down the drain?). Yet, the new emerging story is, and must be, that urbanites can be made to care and have more power to effect change than is perhaps commonly thought. There was a consistent refrain throughout the day about the watery nature of our human biology and physiology, and this was/is another aspect of the re-writing of the new story of water. We are largely made up of water, of course—about 60 percent on average (though it varies by age, gender, and other factors). That we should connect with, and be so profoundly soothed by touching and having contact with water, is not surprising. For me, these repeated references to our watery selves conjure up the ideas of deep ecology that many of us talked about and found compelling in the 1980s. The ideas of Norwegian philosopher Arne Naess that we ought to seek to be at one with a larger “Self” (a “deep” ecology,” in contrast to the more superficial ways in which we adjust our relationship to earth and environment; e.g. Naess, 2010). If we are the water, if we are the river or the ocean, then aren’t we doing harm to ourselves, so the argument goes, when we pollute those water environments? And is there the chance that through seeing greater unity in the world, we will find a way to live less destructively? If our physiology is so inherently watery, does this not bode well for finding deeper caring and connection? The second panel of presenters addressed the subject of solitude, a quality that might seem, on the face of it, to be in short supply in cities. Again, it brought together a remarkable (and unusual) set of thinkers and doers. The sense from these presentations was often not of the potential or promise or benefit of solitude, but just what a difficult relationship we seem to have as a species with the idea. Tim Wilson, who teaches in the UVA Department of Psychology, reported on his fascinating research showing the difficulty subjects have with simply sitting and thinking. We have a difficult time, apparently, just being with our thoughts and through a series of different experiments WIlson has demonstrated just how hard this is for us. In one set of experiments, subjects were asked to sit quietly with their thoughts. They were, however, able to administer a mild but unpleasant electric shock (something demonstrated for them before the experiment began). Remarkably enough, a relatively high percentage of participants shocked themselves (67 percent of men, 25 percent of women), presumably out of boredom (e.g. Wilson 2014). Some shocked themselves repeatedly, rather than sit quietly with their thoughts (and one man shocked himself 190 times!). This result garnered lots of attention in the popular press (and headlines like this one in the Washington Post: “Most men would rather shock themselves than be alone with their thoughts” see Feltman, 2014: ). 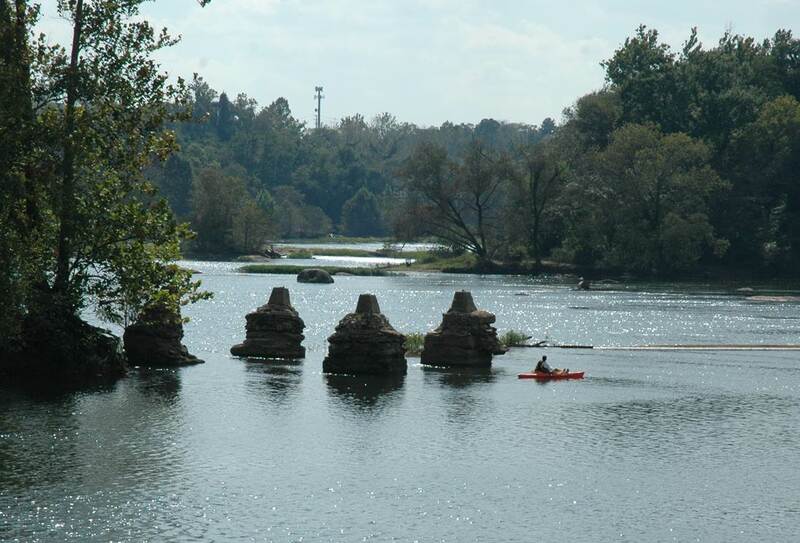 A kayaker on the James River. Cities in some ways are an antidote to boredom. They are rarely boring places, and often the problem is finding places and opportunities where quiet reflection is possible. I remain convinced that humans need the time to and places where they can sit, recharge, reflect, and ponder intensely or not at all. And these places must increasingly be in cities. Designing and planning these opportunities ought to be a major task of city planners, and for me it is the daily connections with nature—whether watching and hearing a bird or sitting in a small park or tending a garden—that can provide those moments of quiet solitude. Perhaps we are inclined to shock ourselves (especially men, it turns out) in part because of where we are: that we are stuck in a room, locked in a stifling interior space with little that is uplifting. In an era where many feel bored waiting for the traffic signal to change and reach for our iPhones, is such a response perhaps partly learned behavior? Water in cities represents some of the best opportunities we have to create conditions and circumstances for solitude, squeezing these experiences (in both a spatial and temporal sense) into cities. Solitude must surely be partly about putting us in the present moment, enjoying the sound of our own breath and the heave of our lungs, quietly watching, listening, being mindful. And the watery realms in and around cities often offer the best chances for finding these experiences, whether floating on a kayak on the James River or sailing in Boston Harbor. One of the best examples demonstrating the therapeutic power of water in a city is Paley Park, a remarkably small park (1/10th of an acre in size) located in highly-developed midtown Manhattan. Designed by landscape architect Robert Zion, it opened in 1967, and has been delighting residents ever since. It is small space providing a quiet respite and source of solitude. It has trees and potted plants and “vertical lawns” (Zion’s words for describing the ivy walls that flank the space), but it is the roaring 20-foot tall waterfall that is the park’s most impressive feature. Seeing and listening to this waterfall is what makes this park so enjoyable, providing an element of unusual solitude. Paley helped to usher in new thinking about the power and potential of small spaces—pocket parks, parklets—and perhaps the need to look for all possible ways to include one or more water features. The Project for Public Spaces (PPS) has declared Paley to be one of the best parks in the country and biophilic design expert Bill Browning frequently uses it as a prime example of the “presence of water,” a key biophilic design principle (Browning, 2014; see his terrific 14 Patterns of Biophilic Design here). Solitude and adversity developed as another theme over the course of the day. Matt McFadyen told a gripping story of being trapped under a sailboat in the Southern Ocean, moments from death, and an equally harrowing journey to the North Pole. Water tests us in many ways, and some of these experience seem more to fall under the heading of solitude under duress. Other speakers over the course of the day described similar struggles; for instance, Blue Mind alum Bruckner Chase, a self-described “endurance waterman,” described his struggles competing as in ironman competitions. There is the suggestion that through struggle and endurance and, sometimes, even through failure and defeat, there is a closeness and affection for these challenging environments; such struggles provide the portal or platform for deeper connections and perhaps for a degree of humility that is helpful in interacting with the ocean world. 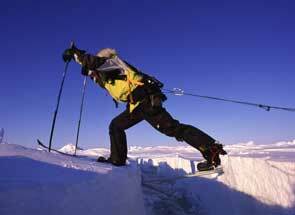 Matt McFadyen at the North Pole. Jamie Reaser, artist and poet, re-framed the challenge as one of “bringing people into their inner wildness.” It may have been the first explicit reference of the day to wildness as a positive, desired attribute, but the wildness of oceans and water bodies was implicit in a number of presentations throughout the day. In the sense of vastness and in the largely uncontrollable power of nature are the possibilities of experiencing awe and wonder. 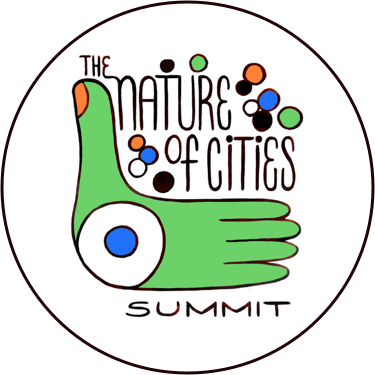 I have often spoken of the need for “cities of awe,” that seek to maximize and facilitate these emotions, and water in and near cities is a major opportunity for this. Reaser argued that we need solitude “to become fully human,” and made a critical distinction between solitude and isolation (a seeking of “apartness” and a more disconnected state). Solitude is as much about feelings of connectedness and relationship; to achieve this need does not require us to require us to escape to a distant place where there are no or few people. That is good for cities and the planet. The profound importance (emotional, health) of sleep is sometimes overlooked, and a fourth major panel addressed the question of Sleeping Deeper. Here there was the very personal and wrenching story of Bobby Lane, a marine veteran grappling with PTS and suicidal impulses. He told a meandering but compelling story of how he discovered surfing. Surfing saved him. After experiencing this, he tells of having his first night of real sleep in a long time. The power of water brought him back from the brink. Sleep itself is an essential human need and so many things in cities have proven to be disruptive to sleep—artificial light, for example, and excessive noise from car traffic, landing aircrafts, and building construction, among others. There is growing recognition of the negative health impacts of bad sleep and the beneficial, health-enhancing effects of good sleep, so it makes great sense for planners and urbanites to give this topic more attention. Bobby Lane is a living example of how spending time in, on, or near water can be part of the answer to good and healthful sleep. This is further support for the many ways that cities might nudge its residents to enjoy these forms of nearby nature and beneficial health outcomes that would result. Good sleep could result from other urban interventions, of course—real efforts at controlling both light and noise pollution would be a start—but I am convinced we often overlook the “blue gym,” to use the language of Michael DePledge, all around us as a partial antidote (e.g. DePledge, 2009). Justin Feinstein, a neuroscientist with the Laureate Institute for Brain Research and co-founder of FLOAT, provided an interesting connection between water and good sleep in his presentation. 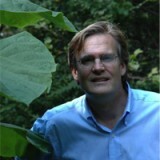 His work has focused on the beneficial effects of spending time in float tanks. It was a fascinating look at the power of this technology in addressing and enhancing urban health more broadly. Spending time immersed in the quiet, dark, soundless environment of a float tank quiets many parts of the brain, and studies show it helps to reduce anxiety and stress and helps us to relax deeply. The studies are more numerous and extensive than I had imagined (27 studies at least; see floatboston.com, undated). These benefits have been shown to last for months. I came away convinced of the utility of a network of float tanks in cities, though I struggled a bit in understanding the planning and public policy implications of float tanks. Feinstein’s presentation also made me ponder the value of floating in cities more generally and the opportunities to do so there. Perhaps less an opportunity for quieting the brain, events such as the Big Float in Portland, Oregon, do provide the chance to sit on and slowly move through the water spaces of a city. More generally, the theme of water and shorelines as medicine re-emerged; it’s one of the most important take-aways. In urban planning and design, there has been a growing recognition of the ways that bad urban form (e.g. unwalkable, car-dependent sprawl) can make us sicker and can inflict a host of health problems. We have been less quick to recognize the inverse, that many urban landscapes (designed and natural) can be profoundly therapeutic and health-enhancing. Bluescapes seem especially to be potent forms of medicine. And this recognition (or re-discovery, more accurately) has lead to new design directions in blue urbanism. Recent examples include the installation of the new Spaulding Rehabilitation Hospital on Boston harbor, along its HarborWay trail. 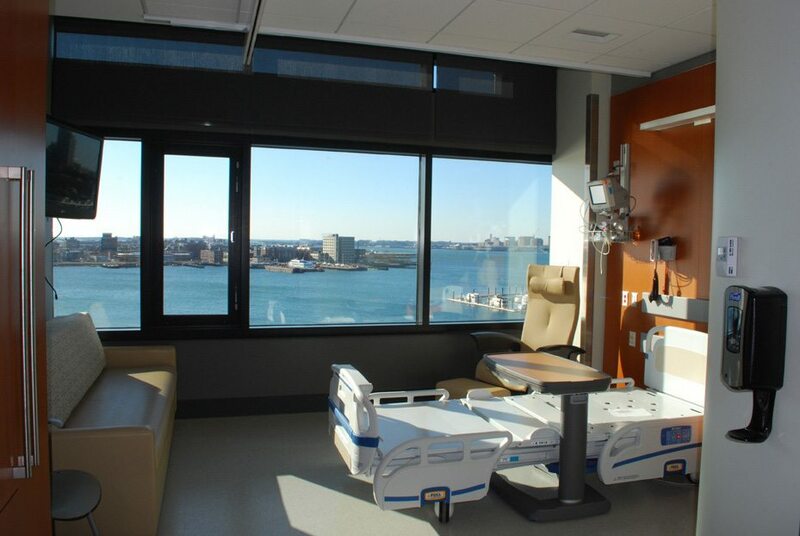 The building is designed to provide extensive views of the harbor through lowered windows in patient rooms, for instance, and from ground level rehabilitation spaces. It is remarkable, in a way, that we have not fully utilized the healing powers of water, so nearby and so often overlooked as potent therapy and medicine. A Spaulding Rehab Hospital room in Boston. Finding ways to float in city, whether in an enclosed tank or as you’re drifting down a river, will deliver benefits. Submergence takes the relationship even further (though to float implies at least partial submergence) and opens up yet another set of ways to relate to water and the topic of the fourth panel. Again, it was a fascinating and eclectic group of presenters. Bruce Becker, a physician from the University of Washington, reported on his research using water immersive therapies. His extensive body of research shows how valuable even shallow immersion—with water up to one’s shoulders—can be for the body (e.g, Becker, 2011). Most of his work and practice have been in pool settings. The physiological benefits are remarkable, as immersion significantly increases blood flow to the kidneys, for instance, and the relaxation benefits are equally great. James Nestor, author of the best selling book DEEP, took us on an amazing story of water immersion of a deeper sort. He reports on the remarkable story of freedivers, who risk their lives to dive and swim to incredible depths (some up to 700 feet). One of the more fascinating aspects of the story is discovery of the ways in which the human body is able to adapt and protect itself at these incredible depths. The “master switch of life,” a set of protective reflexes that shifts blood flow to the body’s core and lowers heart beat to conserve oxygen, kicks in. This is more convincing evidence about the watery origins and deep connections we have to oceans and water, embedded in our basic biology. So what about submergence in cities? How does this concept relate to modern urban planning and emerging ideas of blue urbanism? One is the possibility of swimmable waters in and near cities—harbors, ports, near-shore waters of various sorts. There certainly is a trend in cities aspiring to swimmable (and fishable) waters as an enhancement to quality of life and health. 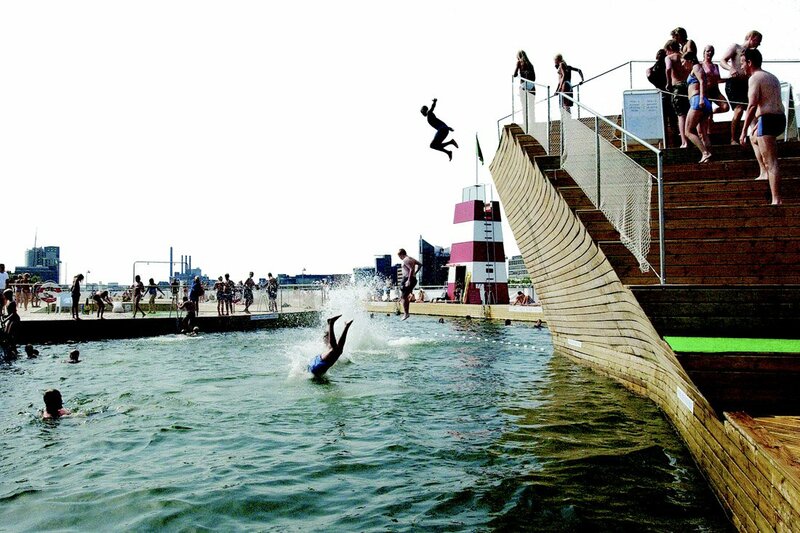 Cities such as Copenhagen have famously opened public swimming areas in the hearts of their former ports where, in the past, industrial water quality would have made swimming unhealthy. Other cities from Berlin to London have taken, or are taking, steps towards outdoor urban swimming. New York city has recently unveiled a plan for creating a river swimming area as a part of its Hudson River Park. The Becker and Nestor presentations provide interesting contrasts in submergence—from shallow to very deep. The shallower opportunities seem more present in cities, but as we seek to better understand and connect to the amazing marine life and biodiversity in coastal and marine cities, opportunities for deeper submergence should perhaps also be a goal. Here I am reminded of Steve Journée, who dives nearly daily in the Wellington (New Zealand) harbor. Urban diving may be a logical counterpart to swimming, with different but complementary benefits. Journée recently published a fascinating book of photographs of the underwater life of that harbor (Journée, 2014). Cities can be, and often are, venues for such deeper forms of submergence, and this may be good for both people and cities. 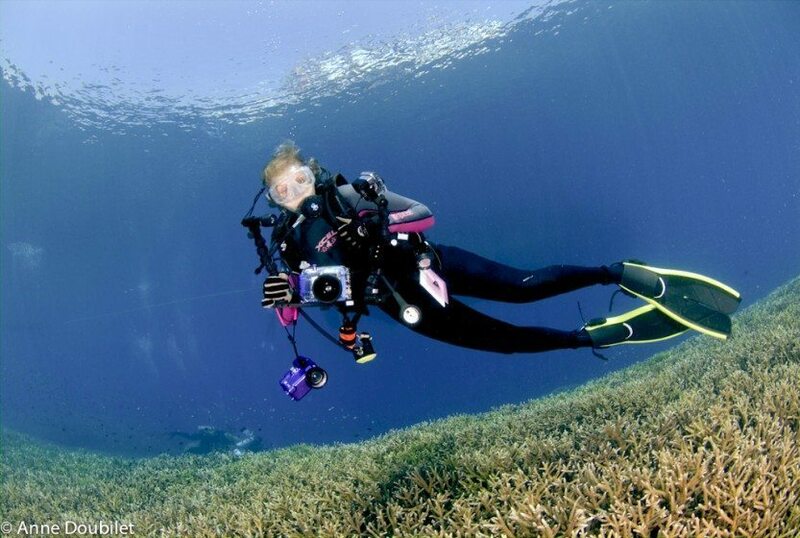 Which brings me to the beautiful underwater photography of Anne Doubilet, who has for many years traveled the world, diving and photographing for National Geographic. Her photographs are wondrous and magical and provide a visual mechanism that might, we hope, provide emotional connections to organisms and worlds otherwise hard to experience directly. A major challenge today is how to foster that deeper connection and caring for marine worlds that are largely out of sight. Few of Doubilet’s remarkable photos are taken in urban environments (though she lives in Manhattan). But they could be and, like Journée’s, they might help to forge a new understanding of and curiosity about what lies below the surface in urban areas—what is just beyond the bulkhead or pier or roadway. Doubilet’s photographic skills are needed, desperately, to capture these underwater city wonders. Papua New Guinea: Anne Doubilet with cameras underwater on reef. Traveling back home at the end of this long day, I pondered why this event felt so different to me. It was in part that I gave it—and the presenters—my full attention. But it was more than that. It was a day devoted to examining—carefully, methodically examining, from many different perspectives and angles—something that is ubiquitous: water. And the methods and presentations came at the promise and value of water in so many different ways. There were academics and researchers, but there were also physicians, activists, artists, and water practitioners of various kinds. And often they wore multiple hats, viewed the world through multiple lenses. Rarely do you find these different people and perspectives on the same agenda, rubbing shoulders at a conference. It was an intentional mash-up in these ways and I am sure that J Nichols compiled his eclectic list of invitees and presenters with this clearly in mind. It was an exceptional day for considering a full range of ideas that don’t necessarily find their way onto urban planning syllabi—solitude, submergence, deep sleep, the need to craft and tell new stories. These are ideas, bodies of research and thought, that have truly remarkable implications for health and happiness and meaning for the future design and planning of cities. At the beginning of the day, J Nichols handed out small blue marbles to everyone and explained how we might use them to think about our blue planet. The marble represented the small, resilient, but fragile planet on which our existence depends. Something to think about but to act upon as well. He extolled us to pass the marble on to someone else—as an act of blue gratitude. It is a creative idea to raise awareness and model some behavior we want to see. 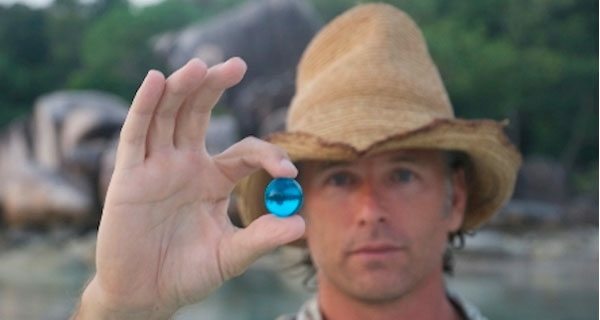 The Blue Marble Project, which began in 2009, has now seen millions of blue marbles change hands and millions of thoughts of gratitude and hope pass from person to person. I have a vision of blue marbles turning up at city council meetings, mayoral campaign stops, and community meetings of various kinds. I know I will be handing some out. J Nichols with blue marble. Becker, Bruce, 2011. Comprehensive Aquatic Therapy, Washington State University Press, 3rd Edition. Journee, Stephen, 2014. Wellington Down Under, Wellington, NZ: Grantham House. Naess, Arne, 2010. The Ecology of Wisdom: Writings by Arne Naess, Counterpoint Press. Nestor, James, 2015. Deep, Eamon Dolan/Mariner Books. Nichols, J. Wallace. 2014. Blue Mind: The Surprising Science That Shows How Being Near, In, On, or Under Water Can Make You Happier, Healthier, More Connected, and Better at What You Do, New York: Little, Brown and Company.